Page 11 is for MODERN accessories only. This cap is a little unusual, due to the thickness of its Sonic design. It is a 'flatbill' style cap, where the brim is stiff, not curved at all. 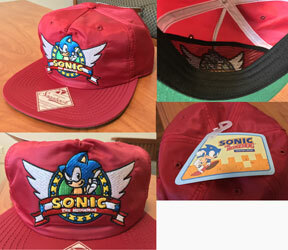 The main cap part is mottled gray, with a single classic Sonic face on the front. It looks like a smooth cloth/embroidery combo item, but it's somehow even thicker than usual...maybe raised on a fabric backing? 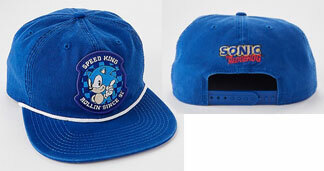 For added interest, the brim is blue, with full color running classic Sonic with a 'speed smear' of color trail behind him. The two elements combine to make the classic type hat seem fresh. This is a 2016 item, but where is it sold? Here's a bit of a clever cap. This cap has been found at Target stores in the USA. Then, there's Sonic detail at every turn. The box looks nice, with X logo, and 2 different Sonic arts. 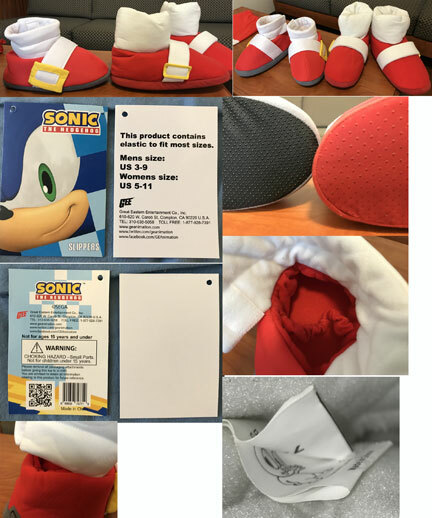 One side of the shoe (outer) has very shiny plastic 'jumping punch' Sonic, and the other side has a textured Knuckles portrait. But look at the background area for Knuckles: those aren't just dots, they're actually little tiny Sonic X logo heads. 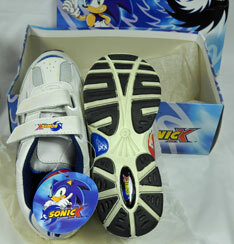 The top velcro has an X logo, the shoe tongue has a plastic Sonic face & the inside cushion layer also has an X logo. But the details don't stop there! Great news! 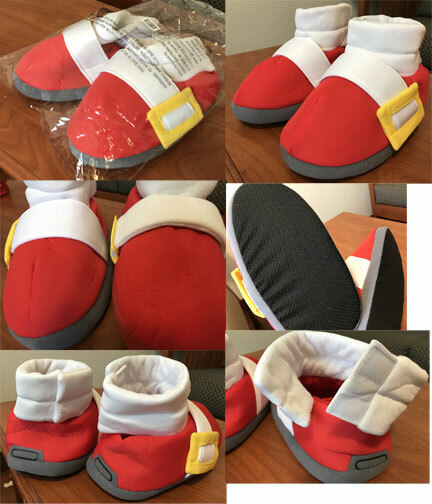 GE released the Sonic Slipper! How does GE's Sonic Shoe Slipper compare to the previously released Drop-Dead pair? Quite favorably! Notice how the GE 'sock' has the line in the center of it to imitate the fold in Sonic's sock, while the Drop Dead one lacks it. The GE buckle is also a more 'cartoony' presentation than the smaller plastic one DD used. The bottoms, while differently colored are about the same. The DD tag though has (probably) Picky the Pig little animal on it as a hidden detail. 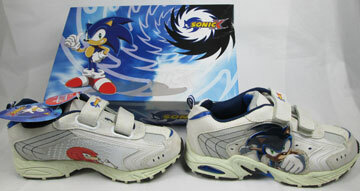 If you like Sonic's shoes...you'll like either pair. The GE ones will be much less expensive for USA fans, however (DropDead is a UK company who ships overseas, but that does add to the cost). They may also fit more feet because of the velcro 'sock' modification. It can fit up to size 9.5 foot (or maybe a bit larger) These are thick with stuffing and make wrinkly noises when walking. Going in-depth with loads of photos and reviews to let you choose the shoes! 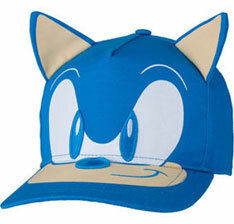 Party City gets in on the 'Sonic face cap' action with this hat. Party City used to sell just decorations, but they broke into a few tees, hats & general-wear type accessories. This hat is one of them, for spring season 2017. 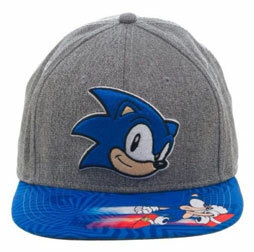 The all-blue ball-cap style hat has stand-up Sonic ears for the top, and his classic forward face spread over the front of the hat and onto the brim. The thing that makes this cap unique (there are so many face caps already) is that it's blue themed. All the border embroidery is blue, and so are Sonic's eyes, nose & mouth line. The only white bits are for the eye edge texture & highlights. This should be avaliable in stores for all of 2017. Price unknown. Here's a snap-back slogan cap. 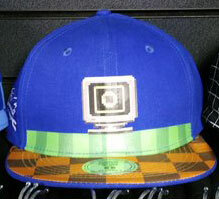 This all blue cap has the 'snap back' flat bill with a thin white border at it's top edge. 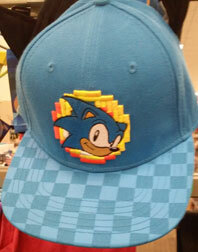 There's an embroidered patch on the front with finger-waving classic style Sonic on a checkered background. The top text says "Speed King" & the bottom has "Rollin' Since '91" The back of the cap is adjustable with a band & also has a full color classic logo embroidered onto the back. With a cool slogan, nice embroidery & added logo detail for the back, this is a well thought out cap. This cap is supposed to be a Spencer's Gifts 2017 item, but is it exclusive to there? It began appearing in summer 2017. Lanyards aren't a passing fad, as this one appears in 2017. This Lanyard has plenty of detail all over. The strap itself is double sided. One has a scattering of white Sonic classic line art on a blue background, the other on black. There is a flat rubber/cut texture finger-waving shaped Sonic harm to go along with your key/card/anything. You also get a getting ready to run art-card in the plastic card-holder. It has the slogan "I'm Outta Here!" & the Sonic graphic is partially colored/sketched. 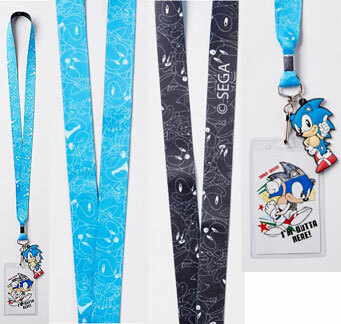 You can use this as the 'back' of whatever card needs to be faced forward on the lanyard, for an extra touch of Sonic detail. This is likely to be a Spencers Gifts item.